The German share price index, DAX board, is seen at the stock exchange in Frankfurt, Germany, October 6, 2017. LONDON - European shares rose on Monday, with Germany’s DAX touching a record high and Spain’s IBEX its highest for a week, as political risk concerns over Catalonia eased a day after a demonstration in Barcelona against independence. 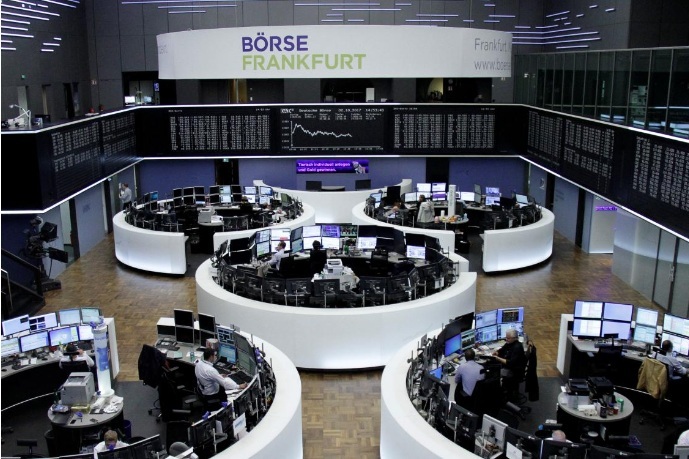 Following four consecutive weeks of gains, the pan-European STOXX 600 rose 0.2 percent while the DAX was up 0.3 percent at an all-time peak of 12,997 points. The IBEX rebounded 0.7 percent with Caixabank gaining 2 percent after its board agreed to move its registered office to Valencia. Banco de Sabadell, which already announced the same move, was the top gainer, up 2 percent. Other firms including Gas Natural, Albertis, Inmobiliara Colonial, are also considering joining a corporate exodus out of the affluent northeastern province, which is putting pressure on Catalonia’s separatist leaders to back down. “There is hope in the markets that independence will not be declared and the worst case will be avoided,” Gautam Batra, head of investments at Mediolanum Asset Management told Reuters. He said he thought things were likely to get worse before they got better, however, as Catalan leader Carles Puigdemont is expected to address the region’s parliament on Tuesday, when he could unilaterally declare independence. “I would urge caution going through tomorrow,” Batra said, noting that volatility, which has been extremely low in the last months, could suddenly rise again. A slight rebound for the pound, which has been hit by British Prime Minister Theresa May’s struggle to maintain authority over her cabinet, weighed on the FTSE, which was down 0.1 percent. On the corporate front, Airbus was the top loser in France, down 2.4 percent after its CEO warned a corruption investigation could lead to large corporate penalties. Credit Agricole fell 1.1 percent after its CEO indicated it would join the queue of potential suitors for Commerzbank should the German government want to sell its 15 percent stake. Commerzbank rose 0.2 percent. Also on the German market, shares in potash miner K+S fall 3.5 pct after a strategy update. Air France KLM fell 1.4 percent after it reported September traffic data. Germany’s B.Z. newspaper reported that talks between insolvent carrier Air Berlin and easyJet over the sale of up to 30 planes were at risk of falling apart. The British low-cost carrier, for which HSBC cut its target price from 1550p to 1500p, lost 1 percent. European shares rose on Monday, with Germany’s DAX touching a record high and Spain’s IBEX its highest for a week, as political risk concerns over Catalonia eased a day after a demonstration in Barcelona against independence.